YOLOBOARD 2017 RELEASES ARE IN! are among their top features. The Serenity is a pattern rich yoga & sealife-lotus-loving hand-drawn board. One of the coolest features is the subtle patterned stain look we've been wanting to do with them since about 2014... finally got the manufacturing there. Enjoy. The Polynesian board is this year's tattoo-inspired offering. Again, we were finally able to get the transparent stain/ink look we've been wanting to do for the last few years. The Turtle Bay design is a water colored take on the yearly turtles we've been doing for Yolo. Always love a chance to do some drippy and trippy art. These design files were so large that nearly broke all the studio's computers to get it right. The end result was definitely worth the headaches. The board also features our hand-drawn logos and taglines. The new Yolo Original boards for 2016 have arrived and several of our designs are headlining this sweet new video. 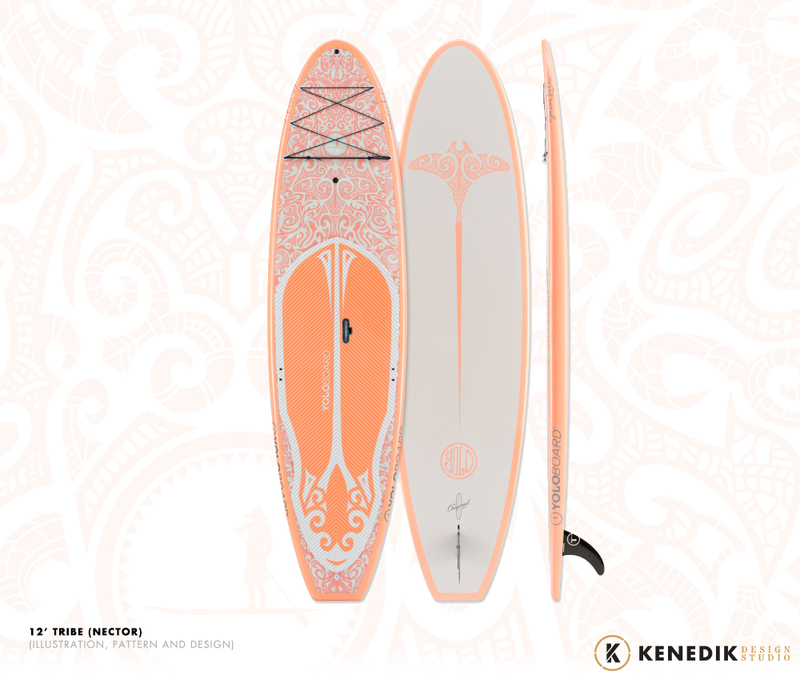 We created the tattoo design, the painterly Sea Turtle design, and the Yoga Turtle design, and the hand-drawn type on the white Richie Gudzan board. YOLO ORIGINAL CATEGORY - ALL-AROUND | SURF | EXPEDITION 12'0" x 32" x 4.8" | 34 LBS RIDER LIMIT - 275 LBS | VOLUME - 236 L Hammerstrength molded epoxy and spectacular graphics by Jeremy Kennedy, Jake Meyer and Richie Gudzan set this board apart from any other.